1. The oldest part of Chiswick is a former fifteenth century pub on Church Street, named the Old Burlington. 2. Chiswick flyover was opened in 1959 by Hollywood actress Jayne Mansfield. Legend has it the body of Ginger Marks, slain by the Kray gang, is buried in the foundations. 3. In 1905 the District & Circle underground lines became electrified, Gunnersby Park station being one of the stops. 4. Famous singers such as Rihanna and Beyonce have recorded in the well known Metropolis Studios on Chiswick High Road. 5. Hollywood actor Hugh Grant grew up and lived in Chiswick. 6. Chiswick has quite a number of blue plaques – including Alexander Pope (poet) and Jack Beresford (Olympic rower). 7. Chiswick House & Gardens was designed by the Third Earl of Burlington, and built for him in 1726 to 1729. It is thought to be among the finest surviving examples of Palladian architecture in Britain. Lady Burlington is reported to haunt her former bedroom, appearing as a reflection in a mirror on the wall. 8. 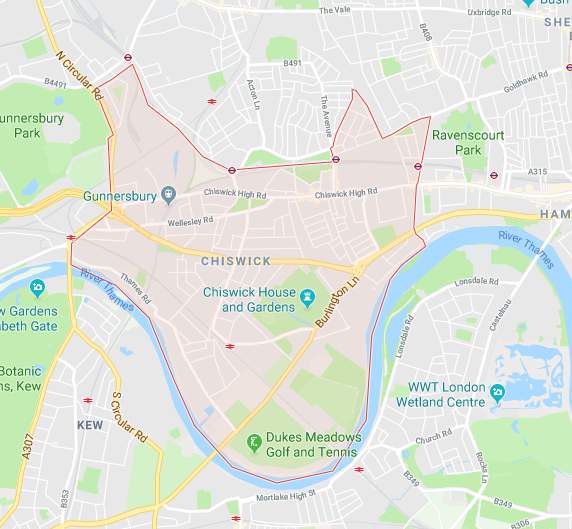 Chiswick is old English for ‘Cheese Farm’ and was an agricultural area with lots of surrounding farmland. 9. The oldest shop on Chiswick High Street is Foster’s Book Shop, dating back to the eighteenth century. They specialise in first editions, illustrated childrens books and antiquarian books. 10. Beer has been brewed on Fuller’s historic Griffin Brewery site in Chiswick since the seventeenth century. Fullers now owns and operates over 380 inns, hotels and pubs across the south of England.